I won the Fruit Snack jackpot! Last week, when Monica and I were studying in my office, we got the munchies and since all the businesses were closing early for spring break she suggested a vending machine. Though I knew there were some in the physics buildings I’ve rarely thought of them. Though Monica showed distain for my gummy fetish, I went for the gummy fruit, “made with real fruit juice” just the way I like it. Well, the money went in, the proper buttons were pressed, and the corkscrew turned and turned. 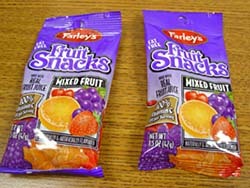 Down fell one Farley’s Fruit Snacks and then… miraculously… a second one teatered on the brink, quivering with fruitiness, yearning to leap free! Their was a moment of hushed anticipation from the gathering crowd (Monica, two ion trapping experiments, and me), I gave the machine a few good whacks and down tumbled the fruitiness to a roaring crowd (except the ion traps, they have to say very, very quiet, ions are fickle creatures). Sometimes life is a glorious thing.